Did You Know? Area 51 Nearly Killed 4 Important Visitors : The Two-Way A declassified CIA report about the U-2 spy plane program lifts some of the veil of secrecy about a part of Nevada that fascinates sci-fi fans. For instance, the men who wanted to turn it into a top-secret site almost died the first time they went there. That's among five things interesting details. -- It Almost Killed Some Important Visitors (Sort Of). "On 12 April 1955 [CIA officer] Richard Bissell and Col. Osmund Ritland (the senior Air Force officer on the project staff) flew over Nevada with [aerospace engineer] Kelly Johnson in a small Beechcraft plane piloted by Lockheed's chief test pilot, Tony LeVier. They spotted what appeared to be an airstrip by a salt flat known as Groom Lake, near the northeast corner of the Atomic Energy Commission's (AEC) Nevada Proving Ground. 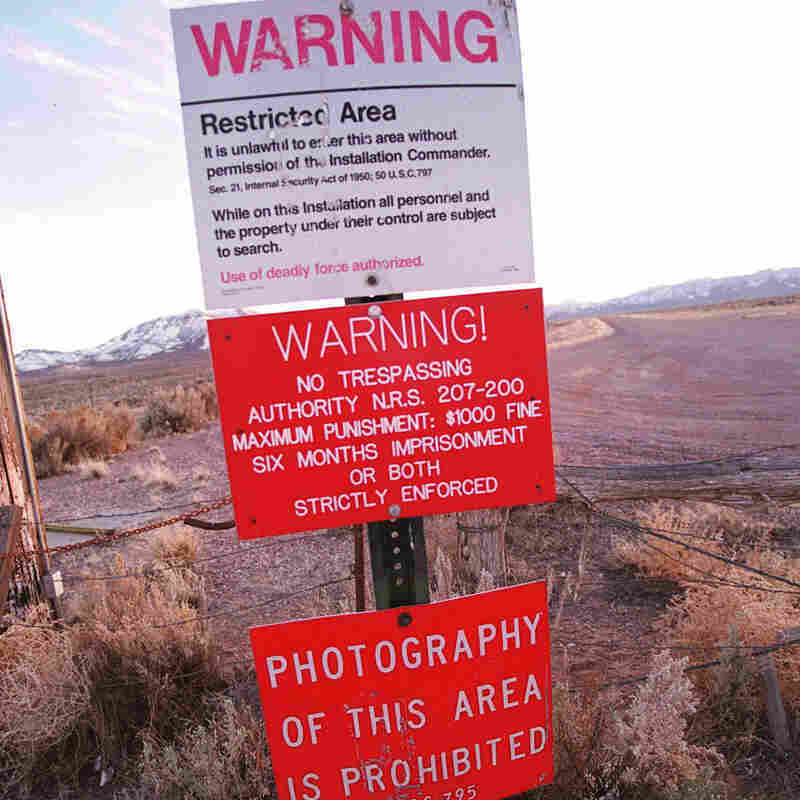 Don't go there: A warning sign marks the boundary of Area 51 in Nevada. "After debating about landing on the old airstrip, LeVier set the plane down on the lakebed, and all four walked over to examine the strip. The facility had been used during World War II as an aerial gunnery range for Army Air Corps pilots. From the air the strip appeared to be paved, but on closer inspection it turned out to have originally been fashioned from compacted earth that had turned into ankle-deep dust after more than a decade of disuse. If LeVier had atrempted to land on the airstrip, the plane would probably have nosed over when the wheels sank into the loose soil, killing or injuring all of the key figures." -- They Had To Call It "Paradise." After convincing the CIA and President Eisenhower to acquire the land, project leaders had the challenge of convincing people to come work there. "To make the new facility in the middle of nowhere sound more attractive to his workers, Kelly Johnson called it the Paradise Ranch, which was soon shortened to the Ranch." -- UFO "Sightings" Were An "Unexpected Side Effect." "High-altitude testing of the U-2 soon led to an unexpected side effect-a tremendous increase in reports of unidentified flying objects (UFOs). fn the mid-1950s, most commercial airliners flew at altitudes between 10,000 and 20,000 feet and military aircraft like the B-47s and B-57s operated at altitudes below 40.000 feet. Consequently, once U-2s started flying at altitudes above 60,000 feet, air-traffic controllers began receiving increasing numbers of UFO reports." -- But U-2s Really Were UFOs To Airline Pilots. UFO reports "were most prevalent in the early evening hours from pilots of airliners flying from east to west. When the sun dropped below the horizon of an airliner flying at 20,000 feet. the plane was in darkness. But, if a U-2 was airborne in the vicinity of the airliner at the same its horizon from an altitude of 60,000 feet was considerably more distant, and, being so high in the sky, its silver wings would catch and reflect the rays of the sun and appear to the airliner pilot, 40,000 feet below, to be fiery objects. ... At this time, no one believed manned flight was possible above 60,000 feet, so no one expecte dto see an object so high in the sky." -- The Air Force, Though, Blamed "Natural Phenomena." "Not only did the airline pilots report their sightings to air-traffic controllers. but they and ground-based observers also wrote letters to the Air Force unit at Wright Air Development Command in Dayton charged with investigating such phenomena. This, in turn, led to the Air Force's Operation BLUE BOOK. "Based at Wright-Patterson, the operation collected all reports of UFO sightings. Air Force investigators then attempted to explain such sightings by linking them to natural phenomena. BLUE BOOK investigators regularly called on the Agency's Project Staff in Washington to check reported UFO sightings against U-2 flight logs. This enabled the investigators to eliminate the majority of the UFO reports, although they could not reveal to the letter writers the true cause of the UFO sightings. U-2 and later OXCART flights accounted for more than one-half of all UFO reports during the late 1950s and most of the 1960s." The CIA report is now public thanks to the National Security Archive, which filed a Freedom of Information Act request for the material. 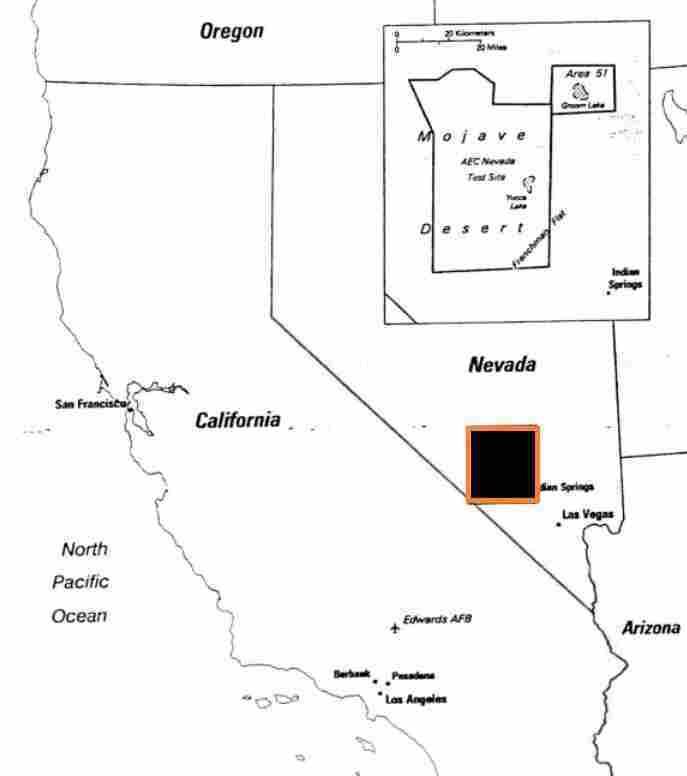 As we reported earlier, the document is getting lots of attention because it's thought to be the CIA's most public acknowledgement ever that Area 51 really is a government facility. The archive's report about the "secret history of the U-2" begins here. We've uploaded a copy of the CIA document and posted it both here and in the box below. Tip: The words "space," "alien" and "creature" don't seem to appear.